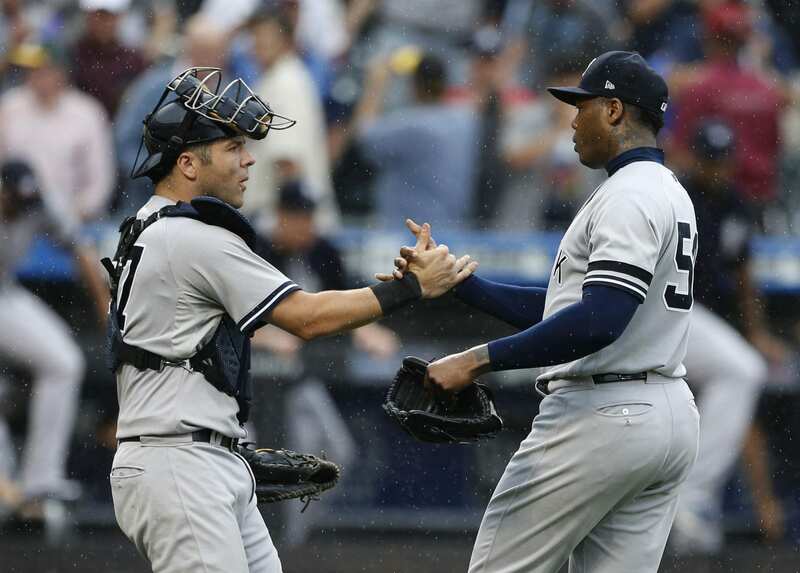 New York Yankees backup catcher Austin Romine is a great guy to have on this team. Romine is not a great hitter, but his defense is excellent. He provides the Yankees with a great alternative when Gary Sanchez needs to recharge his batteries. Romine is not a power threat at the plate, but he has his moments where he will showcase his limited abilities as a batter. Any offense that Ro provides is a plus , but his defense is what makes him valuable to the bombers. Romine behind the plate allows the coaching staff to have confidence at the catcher position throughout the game. He fires lasers to catch runners off guard and those attempting to steal bases..
Romine is an amazing guy for Sanchez to work with. The backup catcher has said that he loves Sanchezs’ work ethic and will work with him to become the best catcher he can be. Romine is a great teammate that never places the blame on anyone but himself. If a pitcher has a bad outing with him behind the plate, Romine will take the blame and say he needs to improve. I have always loved Romine as a player and a person. Many fans came to love the young catcher last season when he went toe to toe with Miguel Cabrera and did not back down from him. Romine is a valuable member of this team and will continue to provide the Yankees with tremendous play from the catching position.